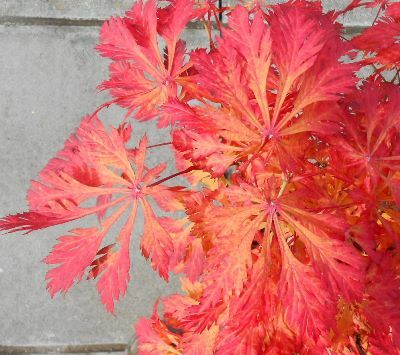 Acer palmatum species – have many leaf shapes and shades turning stunning autumn colours from yellow, through orange, red to scarlet. They prefer sheltered and at least partly shaded sites with moist but well-drained soil. 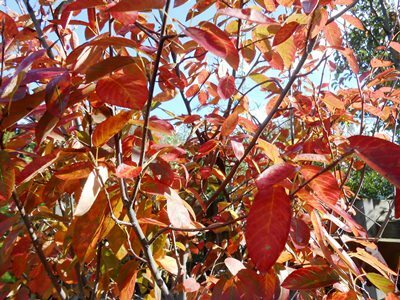 All Amelanchier species have good autumn colour whether grown as a shrub or tree, aswell as small white flowers in spring. A. arborea Robin Hill is the largest we sell reaching 5-10m eventually. A. Ballerina and Snowflakes are ideal for a small garden reaching approximately 6m. Autumn colour is best on neutral to acid soils – not chalk! 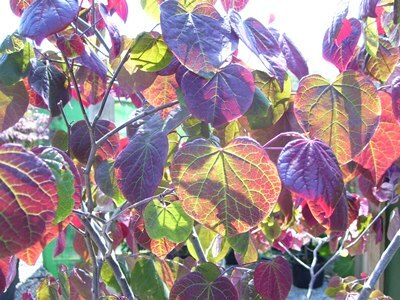 Cercis canadensis Forest Pansy – a shrub or small tree with purple leaves in summer and an attractive range of yellow to orange mixed with purple autumn colour – beautiful with the low evening sun behind it. Prefers a sunny sheltered site. 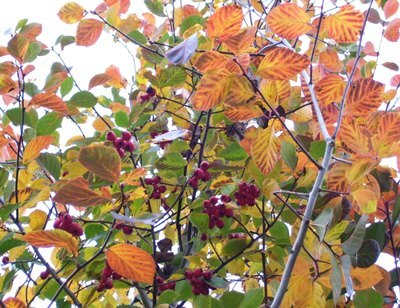 Crataegus prunifolia - a round crowned tree reaching 5-7m with bright red berries and yellow to orange autumn colour – in a good year this can be stunning. This is a hardy tree tolerant of most sites and soil types. Ornamental cherries –As well as spring flowers most ornamental cherries also have some autumn colour – most notable are Prunus sargentii, Prunus subhirtella Autumnalis (which also flowers throughout the winter when the weather is mild enough), Prunus avium the wild cherry, and Prunus Royal Burgundy with burgundy colour leaves in summer turning to bright red in autumn. 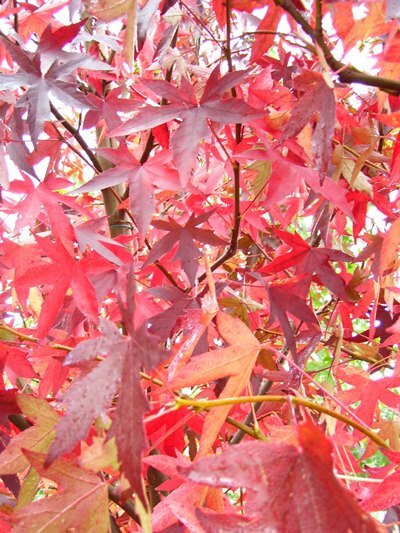 Liquidambar styraciflua and species – beautiful maple shape green leaves turn mixture of colours from yellow, pink, orange, red to deep wine red. A wonderful specimen tree for autumn colour. Can also be pruned into an espalier for stunning screening. 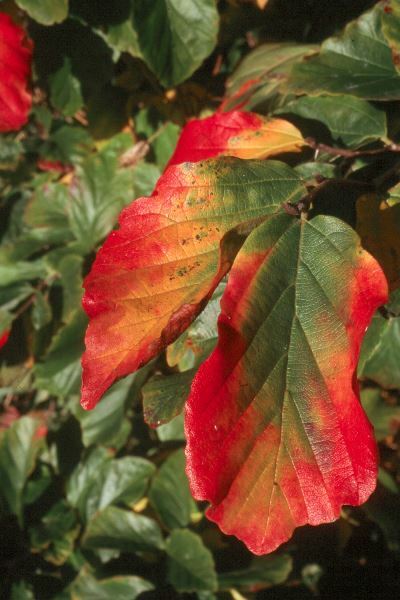 Parrotia persica – Persian Ironwood – an unusual tree with small red flowers appearing before the leaves in March, often multi-stemmed or with low branches that show off the often multi-coloured autumn leaves from orange-red to violet tinged scarlet. 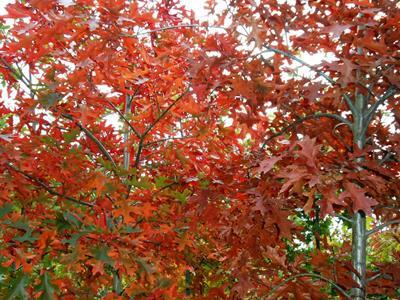 Quercus – oak varieties with good autumn colour include pin oak, scarlet oak and red oak. Large trees with deeply lobed leaves and a range of colour from rusty brown to bright scarlet oaks. Sorbus aucuparia varieties have good foliage colour as well as berries in the autumn making them doubly attractive. Sorbus commixta the Japanese rowan turns yellow to deep coral-red in autumn the variety Olympic Flame is one we highly recommend. Trees with golden autumn colour include Liriodendron - the tulip tree, Acer campestre - field maple, Tilia species - limes and Gleditsia. 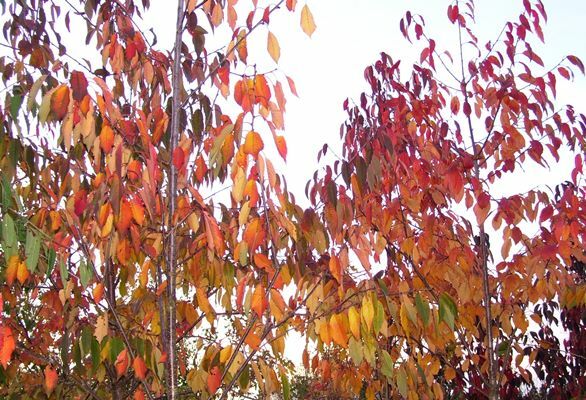 This entry was posted in Plants for Autumn Interest and tagged specimen trees, Autumn colour on October 7, 2015 by englishwoodlands.